This article doesn't have any practical advice in it. It's more about understanding how you may have become the way you are. It may also be encouraging in the sense that it shows that plenty of other people have been in your situation as well. I've noticed people with social issues are pretty interested at looking into their childhoods and speculating about what caused them to end up as shy, awkward adults. I've also gotten a few emails asking me questions along the lines of, "What do you think causes poor people skills? Such and such happened to me as a kid, and I feel like that was a reason for me. What do you think?" This article will list some of the inborn and life experience factors that can lead to weak people skills. I used the word 'causes' in the article's title for simplicity's sake, but I don't want to imply that if a factor is present it automatically and directly leads to problems. It's more that they can nudge some people in the direction of becoming more socially awkward. However, not everyone who experiences them is affected to the same degree. I tried to organize the factors into rough categories, but some probably could fit under more than one. Certain inborn personality traits seem to predispose people to having social problems as adults. Again, having a particular personality doesn't mean you're destined to have social issues, just that if you're already leaning towards being awkward, certain life events can more easily 'activate' it. I'll go into some of those life events later in this article. One thing to note about personality traits is that even though they are core parts of a person, certain ones don't automatically doom someone to becoming hopelessly and irrecoverably socially clueless. 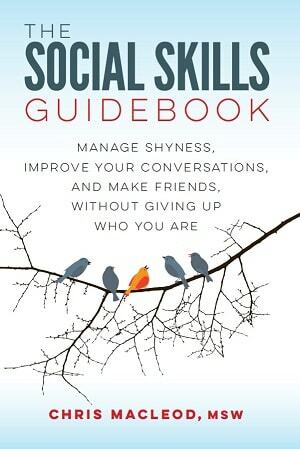 Someone with them can learn to become comfortable and skilled in social situations. They may just have to work harder for it. This one is the classic. Some people are born with a more inhibited, anxious approach to the world than others. Their nervous systems are just wired to be more reactive or sensitive to stimuli. Even as babies and toddlers they'll have a stronger negative response to change and novelty in their environment. They also tend to take longer to 'warm up' to new situations. An anxious temperament is often associated with the development of shyness, and the insecurities and avoidance of social situations that go along with it. It can also make people be overly cautious, risk averse, and thin-skinned. The higher sensitivity to stimulation that's built into this temperament means that people may also be put off by activities that others enjoy. A well-known example is an adult feeling irritated and overloaded at a loud, bustling party. Compared to other people, who may not be as fazed, they're put at a disadvantage when they have to interact in these situations. People who are more cautious and intolerant of risks can also fall behind their peers because they're not as eager to jump right into things like dating, partying, or learning to drive. This can create situations where, say, all of a girl's friends are dating, but she doesn't feel ready for it. Eventually they may grow apart from their social circle because they have different priorities. Additionally, in many cultures children are seen as weak and flawed for being too hesitant and sensitive. Some people seem to have a lower built-in need to socialize and spend time with others. They'd rather stay home and read or work on a project than go out with people. When they're not around people, they don't feel as much pain or loneliness either. That's all fine. Not everyone has to be a social butterfly. However a side effect that can sometimes happen is that if someone spends too much time on their own, they can miss chances to develop their social skills, and lag behind everyone else. Some intellectually gifted people seem to have problems adjusting to the social world. The common explanation I've heard is that their minds aren't only sharper than the average person's, but also work on a somewhat different (not necessarily better) wavelength. This difference may give them difficulty in understanding and applying some aspects of socializing. Their intelligence may also give them problems in relating to their peers. However, not every highly intelligent person has social difficulties. Many do just fine with other people. The thing is they can slip under the radar. The gifted people who do have social problems stand out more, and can sometimes create the impression that everyone with high intelligence is destined not to fit in. This one can be related to being naturally anxious, but not always. Some people have trouble going with the flow, and coping with any changes to what they think is their plan or routine. Socializing tends to be unpredictable and improvisational though which can cause problems for people who are more rigid. This section could get too big if I let it, so I'll keep it brief and vaguely say that all kinds of non-typical personality traits may be related to social issues later in life. For example, if a kid is really eccentric, artsy, and creative, and most of his peers aren't, you could see how problems could develop. If people have certain interests it may make them more likely to experience social problems down the road. Some interests may lead a person to get picked on, not be able to relate to their peers, or cause them to feel misunderstood and alienated. Others may cause them to miss chances to practice their social skills. Some studies of men who were socially awkward later in life show that as kids they weren't into typically male things. Mainly they were unathletic and didn't like team sports. They also weren't into roughhousing and being physical and aggressive and competitive. Anyone who's been through this themselves can attest to the rift it creates between you and your classmates. It can be similar with females. I've read anecdotes of socially awkward women explaining how as kids they were never into typically "girly" things, and the issues it caused with their peers because of that. There's nothing wrong with doing things on your own in and of itself. However, as I mentioned above, spending too much time alone can cause your social skills to fall behind. A person pursuing solitary interests may be doing so because they just prefer being on their own, because they're too anxious or gun shy to attempt to be with other people, or a combination of the two. Although some kids naturally pick it up more easily than others, every child has to be taught good social skills to one degree or another. Sometimes this occurs in an indirect, organic way, as children observe people as they go about their lives. At other times adults teach them proper social skills in little lessons here and there. Some children will also be formally taught communication skills in the classroom or therapy groups. Sometimes kids don't get the social education they need, or it keeps getting disrupted, preventing them from properly learning what they have to. Some kids may be set back because they don't have anyone good to model while growing up. Maybe both of their parents were a bit awkward and unsociable themselves. Maybe their friends in school had social problems and shouldn't have been copied. Their whole extended family could be setting a bad example for some specific behaviors. Some people will even look back and blame their entire culture for their social awkwardness. For example, I've heard this from guys with Indian or Chinese backgrounds who are living in Western countries. They feel like their culture's social style, and its emphasis on academics over socializing, has left them at a disadvantage. Some adults with social issues point to their overly sheltered upbringing as the main culprit. Because they were sheltered, they either didn't get a chance to practice their social skills with other kids, or they learned things that weren't all that helpful when they got out into the wider world. Some people report just being an only child as making them sheltered enough to develop social difficulties later in life. There are a lot of ways kids can be sheltered. An interesting one is that studies show parents who are more socially awkward and anxious themselves tend to restrict the activities their kids can do. This may be because they want to protect their child from what they see as a scary social world. It may also be because the parents want to avoid the socializing that would be involved for them if they allowed to child to get out more (e.g., having to chat to their children's friend's parents). Some children seem to adapt well enough to moving around a lot, but others have a tougher time with it. Constantly being the new kid and having to make a fresh group of friends may be too much for them, or may amplify other vulnerabilities they already have. You can't exactly get much practice being with other children and developing your social skills if you're in and out of the hospital, or too physically frail to go to school or be around your peers. It's not hard to think of ways that moving to a new country may affect some children's social development. They're in a whole new environment, a new language to learn, new cultural customs to adapt to, new unspoken social rules to figure out, and on and on. Not to mention that some kids can be prejudiced jerks and ostracize someone who's from another part of the world. Immigrating can impact adults as well. In their home country they may have been quite socially capable, but they feel lost and self-conscious and unsure of themselves in their new location. 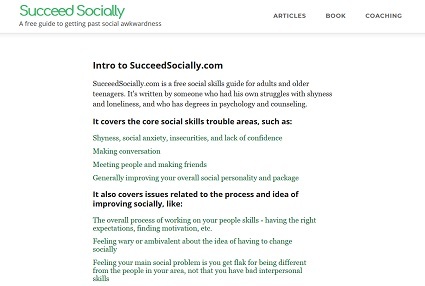 A number of factors related to weak social skills all have to do with someone being picked on when they were younger. Being bullied can kill people's self-esteem and make them anxious about future interactions. It can also leave someone feeling wary and bitter about other people and socializing in general. When a child is teased it can also make them feel really confused and off-balance, and cause them to act in socially inappropriate ways as they flail around testing out behaviors to try to get the teasing to stop (e.g., yelling out weird things at other people in an attempt to 'fight back' or drive them away). Children typically get picked on by their peers, but they can also feel put down and bullied by their parents, siblings, relatives, or other adult authority figures. Some people report being constantly teased by their older brothers, sisters, or cousins. Others mention insensitive, unsympathetic teachers or coaches. Really, anything that other kids can latch onto is a potential target. Sometimes a kid doesn't even have to be directly teased to develop poor self-confidence. It may be enough that he or she just feels like they stand out and have something wrong with them. All kinds of people can get picked on, but I think if a male is smaller as a kid he's at a greater risk. If he is physically bullied he doesn't have as much of a capacity to stand up for himself. Being smaller, he may not even think asserting himself is a viable option. A unique problem with having a physical difference is that it provides a convenient spot for someone's insecurities and social anxiety to attach to. Most of their social worries and low self-esteem can become about how supposedly weird looking they are. Even if they could improve their social skills and self-confidence in theory, everything can come back to, "Yeah, but what's the point? I'm still too funny looking. No one is going to like me because of that." Their supposed personality flaws (e.g., being a loner, a cry baby, a wimp, annoying, 'weird', etc. What really keeps a vicious circle going is when a kid is teased for being shy). In regards to authority figures, some people say their problems are related to incidences where a teacher or coach put them on the spot and embarrassed them in front of everyone. It's easy to see the harm in being picked on. People have also mentioned other childhood experiences that damaged their confidence and sense of self-worth, which affected how they related to everyone. Some people report losing their self-confidence because a sibling or friend of theirs was just so successful socially. They felt inferior and like they couldn't compete, and so checked themselves out of the game. This is another sub-category that I've heard personal accounts about. As an example, a child's parent may die suddenly. The loss throws them for a loop and their self-confidence and sense of feeling safe and secure in the world is never the same. Their bereavement may understandably cause them to withdraw from the world. Some grieving children are even ostracized by their classmates for being sad all the time. I've read several stories from self-identified socially awkward people who put part of the blame for their problems on less-than-perfect upbringings. More than anything the experience can instill in children a sense that they're fundamentally flawed and unlikable. A rough childhood can also be related to some of the other issues mentioned above, like getting picked on. Some children who have been abused will become much more shy and withdrawn. Other kids will do the opposite and start acting out and getting into lots of trouble. A child may become distrustful of others and guarded about sharing their thoughts and emotions. Their self-esteem may plummet, as they see themselves as worthless and somehow deserving of the abuse they've received. In order to create a sense of safety for themselves some people will adopt a tough, unpredictable "Don't mess with me" stance that drives their peers away. Abuse can lead to the development of some pretty severe mental health issues, which cause their own set of problems. Many thinkers have identified broader forces in society that could make it easier for someone to develop a more socially awkward, isolated existence. When talking about this stuff there's always a tendency to portray the past as some uniform golden age where none of our current problems existed. That's hardly true. It's more that each era has its own mix of strengths and weaknesses. It's not like we can turn back the clock either. Still, it never hurts to be aware of these issues. If someone isn't good with people these days they have plenty of options for entertaining themselves. They can go on the internet, watch movies, or play video games. Even easy access to books is something that's relatively new in our history. All this can prevent someone who's already predisposed to being awkward from gaining social experience, and keep them in a rut. Like I was saying, I don't want to paint a rosy, simplified picture of things, but I think overall it's safe to say that in the past people had to go outside and interact with each other much more often. Even when people are being social with each other, technology makes it easier to avoid face-to-face communication, which can be the most anxiety-inducing, but also provide the most learning opportunities. In the past we had to do most of our interacting in person. You could imagine that even more awkward people would have no choice but to face their fears and gain more social experience. Nowadays we often don't even have to talk on the phone if we don't want. In the past most people lived a rural existence. Today most of us live in cities, which by their design can be isolating places. I wouldn't say they get in the way of someone developing social skills when they're growing up, but they can certainly make things more difficult for adults. For better or for worse, when someone lives in a smaller tight-knit farming community, everyone tends to interact and know each other's business. When you live in a larger center it's easy to fall into that situation where you're surrounded by millions of other people, but still feel alone. This section doesn't have the space to be exhaustive, but a variety of mental health problems can lead to social weaknesses. Some people who are dealing with loneliness and social awkwardness are depressed about their situation. The symptoms of depression make getting out of the hole more difficult as well. If someone is depressed from a young age, or during a formative part of their life, the condition can also get in the way of their social development. Everyone else may be out there socializing, while they're at home feeling worthless and lethargic and unmotivated. I could almost write the same paragraph as the one above to describe the impact of anxiety. In particular, social anxiety can disrupt a person's current and future social success. You could make a case that any type of mental health issue, if it's severe enough, can lead to interpersonal problems. For example, someone who has Obsessive Compulsive Disorder and who hoards countless boxes of old knick knacks is going to have their social life disrupted in all kinds of ways. The mood swings inherent in Borderline Personality Disorder severely undermine relationships. People with schizophrenia, arguably the most severe mental illness, have a wide range of social deficits.